Women tended to support Mr Siddaramaiah more than his nearest rivals and he was more popular in smaller towns and cities. 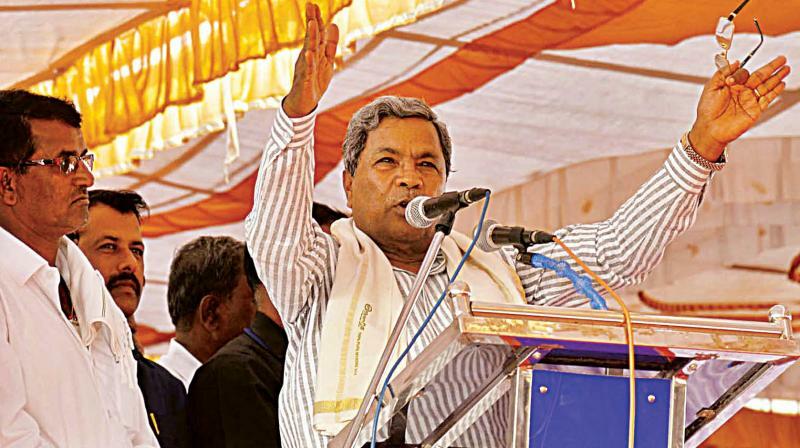 Bengaluru: A survey conducted by Lokniti-CSDS, an independent research organisation would certainly bring cheer to Chief Minister Siddaramaiah, as a whopping 49 per cent people chose Congress over the nearest BJP which drew only 27 percent backing, and the JD (S), 20 per cent support. To add to this is the approval rating of the CM. As many as 34 per cent of respondents want Siddaramaiah as chief minister after the assembly elections. Surprisingly, the BJP's CM candidate B.S. 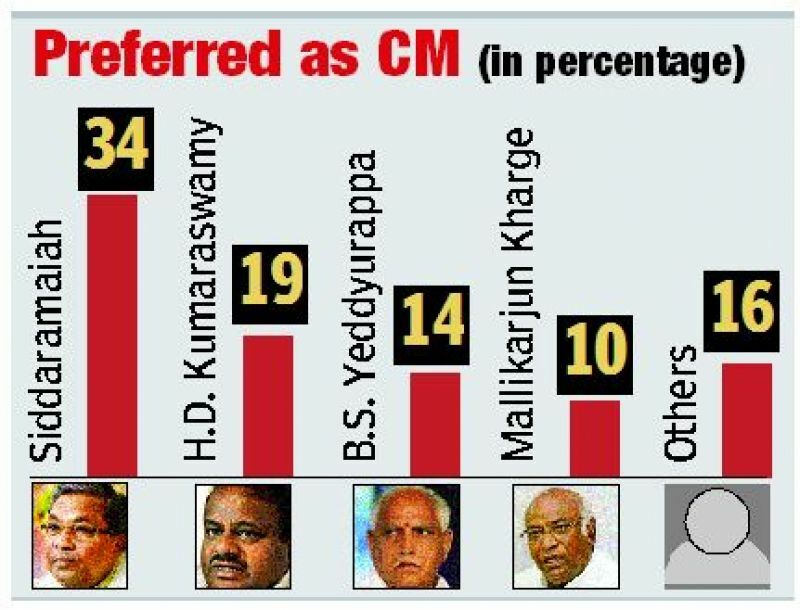 Yeddyurappa stands third with a mere 14 per cent while the JD (S)' H.D. Kumaraswamy got 19 per cent votes for the CM post. Curiously, Congress' leader in Lok Sabha, Mallikarjun Kharge got a traction among respondents with 10 per cent backing him. As part of the Mood of the Nation Survey, Lokniti-CSDS conducted an additional exercise to perceive the mood of people of Karnataka which will go to the assembly polls in three-to-four months. This survey focused on four major areas: performance of the incumbent government, who the respondents would prefer as the next chief minister, the important issues to be kept in mind while voting and finally, which party they would vote for in the assembly elections. In the category of satisfaction, Bengaluru gives a thumbs down to the government with 55 per cent respondents said they were “somewhat dissatisfied”. Overall, only 11 per cent said they were “fully satisfied” and 46 percent said they were “somewhat satisfied”. The Congress party seems to have better image in smaller towns and cities which is the opposite of the trend in Bengaluru. The level of satisfaction was clearly much higher among non-dominant backward castes, scheduled castes, scheduled tribes and high level of satisfaction was shown by the respondents from southern Karnataka, Mumbai and Hyderabad-Karnataka. The survey was conducted under the overall guidance of national co-ordinator of Lokniti, Dr Sandeep Shastri pro vice-chancellor of Jain, a deemed to be university. For the question on who would they prefer as the chief minister, no names were suggested, Dr Shastri clarified. Women tended to support Mr Siddaramaiah more than his nearest rivals and he was more popular in smaller towns and cities. Mr Kumaraswamy got more backing in Bengaluru city while Mr Yeddyurappa's support was uniform across rural and urban areas. He got greater support among Lingayats while Mr Kumaraswamy got more among Vokkaligas. Mr Kharge was mentioned more frequently by respondents from SC and other social groups. Among the issues, nearly a quarter said they would go by the track record of performance of the ruling party and that of the opposition. Rural respondents gave more weightage on agriculture related issues, that is 11 per cent while those from the urban areas focused on development issues such as unemployment and price rise that is six percent. Interestingly, in Karnataka nearly 47 per cent voters said they would vote for the Congress if Lok Sabha elections were held today and the BJP got the support of 27 per cent respondents and the Janata Dal (Secular), 20.